4. Next step is to download tutorial project from repository (or from here) and import it to your workspace. Remeber to add previously imported google-play-services-lib project as library! And don’t forget about downloading platform with Google API image in your SDK Manager! First of all – manifest. Surely you found new xml tags there. First one is declaration of uses-feature – we specify version of OpenGL ES which is required to run the app. Next there are some required and recommended permissions. Last but not least metadata tags where one of them contains previously created Maps API Key – this really important tag. Hint: Highlighted line tells you that here we use activity’s fragment manager. AddressDetailsFragment.java – In the fragment we will check if Android have access to Google Play services (and if everything seems to be ok) and load fragment with the map in proper container declared in XML file with layout. Please note that here we used ChildFragmentManager! 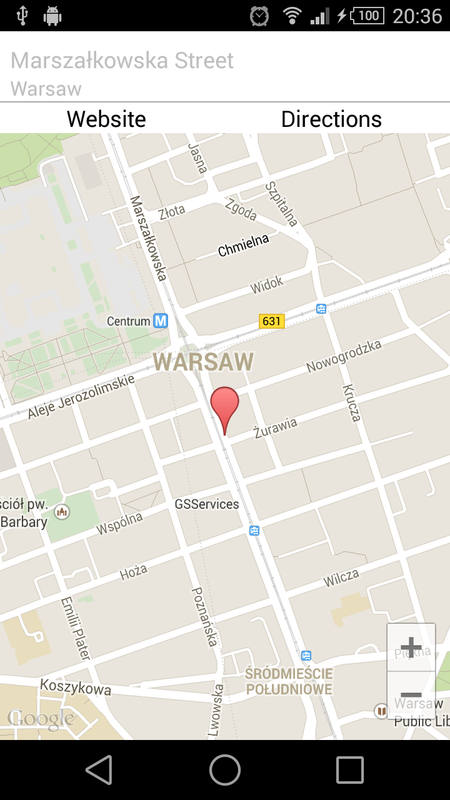 MyMapFragment.java – of course I don’t forget about our hero-fragment with map. 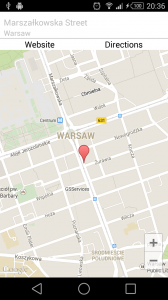 This fragment extends SupportMapFragment (Google API) and in onCreateView initializes the map. initMap() method moves camera to (passed by argument) position and set zoom to 15. In next lines the marker, gestures and compas are enabled. Working APK file is available here. Leave your comment below, share this article and thanks for reading!